Looking for ways to keep your Data Center Server Room cool? Consider the hot aisle/cold aisle layout is a design for server racks. This configuration is beneficial as it will conserve energy and lower cooling costs by directly managing air flow. Is the Logical Approach Really Logical? Click image to get full few of a data center hot aisle/cold aisle layout design. Most modern IT equipment will take in air from the front of the unit and exhaust the hot air through the back. The logic might be then that when servers are placed in rows with the front of the racks all facing the same direction, then there will be consistent airflow. However, if there are several rows where the fronts are facing each other, that creates a significant energy efficiency issue. The hot air will get sucked into the cooling intakes, and with each successive row the temperatures increase, eventually overheating the front servers. To prevent overheating, place the rows of server racks so that the fronts of servers face each other. Additionally, the backs of servers should also face each other. Hence, creating the hot aisle/cold aisle arrangement. If properly organized, this configuration serves to reduce energy loss significantly. What are the benefits of the hot aisle/cold aisle configuration? Optimal ventilation and managed airflow thus reducing cooling costs. Reduced internal equipment fan speeds, so less wear and tear. Prolongs the life of the equipment. Additional capacity out of the same space due to decreased temps. An increase in projected profits due to lower energy costs and greater capacity capabilities. Can you retrofit for hot aisle/cold aisle design? Yes, but note there are some considerations, the first being the initial cost. But, honestly, in the long run, your energy savings, and reduced equipment wear and tear will be worth it. Shut down all servers and unplug before moving, plus all cables labeled correctly. An electrician may need to realign power pathways so the unit can easily be plugged in for the new configuration. 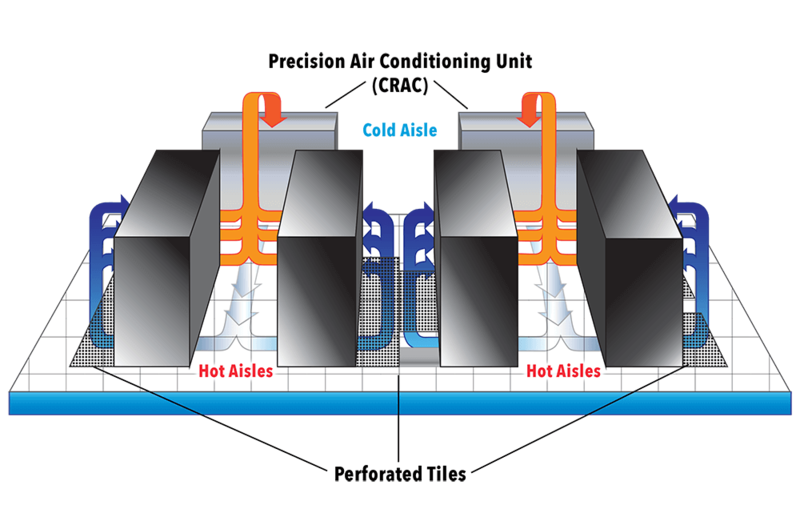 HVAC needs to be adjusted to accommodate the hot aisles and avoid hot spots. New containment systems built to prevent cold air and hot air from mixing. Installation of automatic entry doors to prevent cold air from escaping. Raising the floor 1.5 feet to encourage increased airflow. Note: Do not use the hot aisle/cold aisle orientation with servers with solid plexiglass doors. Vented doors are necessary for this configuration to work. Are you designing a new data center server room? Are you seeking to retrofit an existing data center? Contact The Severn Group. Our team of qualified HVAC technicians can assist you. We have years of experience from initial design to final installation. Contact us today for a consultation.